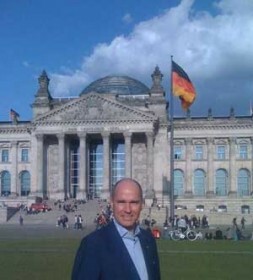 German entrepreneur and geo-strategist Dr. Hubertus Hoffmann in front of the German Reichstag: "The wind of change in Germany and the new partnership of CDU/CSU and FDP in Berlin provide hope for a positive and fresh political start in Germany and it also sends positive signals to the rest of the world." In the German Federal elections that took place on Sunday, September 27, 2009, the people of Germany voted to change the Grand Coalition of the Christian Democratic Union (CDU/CSU) and the Social Democratic Party (SPD - only 23 % with a loss of 11.2 %) to a new fresh partnership between the CDU/CSU and the Free Democratic Party (FDP). Together, the CDU/CSU (33.8 %) and the FDP won more than 48% of the vote, with a safe majority of 42 seats in the German Bundestag. But the CDU, chaired by Chancellor Angela Merkel, lost some 1.4 percentage points in votes while the FDP had an increase of almost 5 percentage points pushing their win of the votes last night to 14.6 %. So the real winner last night was the FDP. They stand for a free economy, liberty and free markets. The new government under Chancellor Merkel and designated new Foreign Minister Guido Westerwelle will promote a more market-oriented policy, including lower taxes. The incoming government will also have a pro-NATO stance in foreign affairs, support a strong German-American partnership and engagement in Afghanistan. The new partnership provides hope for a positive and fresh political start in Germany and it also sends positive signals to the rest of the world. The left-wing and the old communist rooted Left Party (‘Die Linke’) received only 11.9 % of the vote. They have no influence now in Berlin and the federal level and were not able to convince more voters with their demand for an immediate withdrawal of German soldiers from Afghanistan. A dragging on of another four years of a Grand Coalition has been avoided. Germany will become more self-confident and more market-oriented in the next years as a result of this election. Jackson Janes, Executive Director of the American Institute for Contemporary German Studies and member of the WSN Advisory Board "The election results are good for Germany and German-American relations. The German partner can respond to the challenges ahead-the new coaltion will deliver that."